Single cup coffee makers can be expensive (think Keurig or Tassimo), but luckily Senseo have produced a machine that does most of what the other single serve machines do, but at a much lower cost. This dinky little machine can brew up to five 4 ounce cups when the reservoir is filled to the max. It has two pod holders, each holding a 4 ounce pod - so when you brew the large 8 ounce mug, simply fill both pods, and hit the "two-cup" button (as opposed to the "one cup" button). (Note that if you want a 10 ounce brew or drink a 12 ounce cup, this machine is too small). All the parts are removable and dishwasher safe. It uses Sara Lee coffee pods, which are available at most supermarkets (and online). It comes with a limited one year warranty. 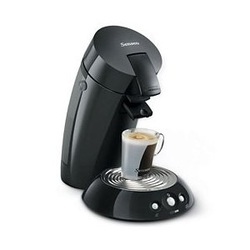 If you want a good value coffee maker, then the Senseo single cup coffee maker is perfect. It will brew teas, chocolates, cappucinos and lattes with no trouble (though it doesn't do espressos).